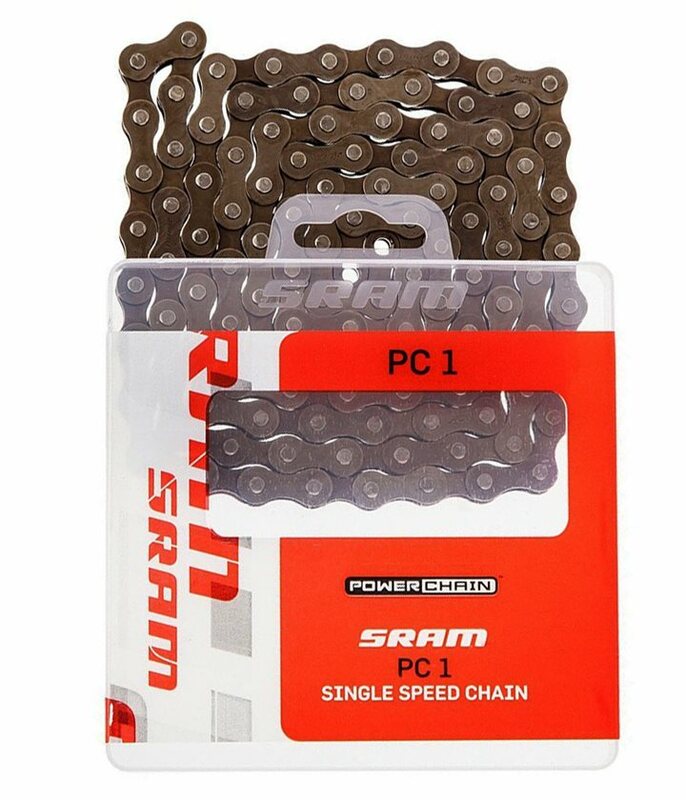 SRAM PC-1 Single Speed chains. An excellent choice for all singlespeed and track bicycle applications, including older 1 speed bikes like beach cruisers, etc. as well as today's high-end singlespeed MTBs. For 1/8" single speed specific cogs and chainrings only. Do NOT use on drivetrains designed for use with multi-speed 3/32" chains. Have the same chain on another Bike and got this one for new project. With proper maintenance it will last for a long time. Perfect. Did exactly what I needed it to do. Easy installation. inexpensive? CHECK. strong? CHECK. what else do you need for a single speed chain. I live at the beach and the sand and salt air does a job on chains, I keep these fairly clean and lubed, and I get years of use and abuse out of them.. SRAM is the way to go! I've been using SRAM ss chains for years. Cheap and tough as nails. Never broken one. I've broken 8 and 9 speed chains before, but these just take a mud-filled pounding and keep going. There is a service life, of course. It does stretch like any chain, but it'll never leave you stranded. I also love SRAM's power link connector. Quick and easy. Highly recommend for your single speed rig. I use this on a 1/8" single speed road bike setup. Good, solid chain for a good price. It lasts me plenty of time with little maintenance - and I don't mind replacing it at the price. I ordered this chain to use on my son's pull along. It's working great, no complaints! I really haven't had any problems with these chains, and at $13, they're a good deal considering we haven't had any problems and the bikes they're on see approx 50 miles per day. I'm using this chain on my single speed MTB. It is a little bit heavy, but you'll never break one. buy it. Using this on my single-speed commuter over the winter (lots of salt and sand). It wore out in a predictable timeframe (lasted about a month longer than the KC I had on it last winter). The other reviewers seemed to not like it, it has performed as expected. I'm torn between giving it 4 or 5 stars simply because heavy. it's only downside imo. very strong & capable. Bad bad...The chain stretched and then proceeded to jump. Chain line was perfect. At least it did not break. Will only last a month of good riding. I would even think twice about putting this on my townie. This chain was 70% on my chain wear gauge when I fitted it. I've been riding for 35 years, this is the first chain I have ever had break on me. Lasted for 800 miles of mostly road use on my SS MTB. Cleaned, lubed and adjusted as needed. Stretched a lot then...pop. Maybe I got a bad one, I don't know. You get what you pay for. No more $10 chains for me. At first glance this chain appears big and sturdy compared to my 9 speed chain. It rode fine and never broke but wore out quickly and finished of my drive train. I will not buy another. Can a 1 spd chain be shortened like any other chain? BEST ANSWER: Yes. And to reconnect it after removing links, it'll either include a powerlink that makes it very easy, or you'll need to bend the chain so that the links snap together. Hard to explain, but there should be something on YouTube for it. If you have a chain tool, yes, it can be shortened like any other chain. It's just a tiny bit wider and won't really stress your chain tool any more than any other chain. Pretty much. The master link might be different. But, just a normal chain tool and follow instructions for however you re-join it and it's good. yes with the wright tool. you may have to buy half link, come competed the job. Yes, you can remove links using a chain tool like any other chain. Of course it can just use a park tool chain tool. Yes, very easily with a chain tool. Does this chain come with the power link? BEST ANSWER: I believe they call it Snap Lock, which comes with the chain. You will need a chain breaker to get the correct length. No. This chain comes with a standard quick link. Yes, this chain has the power link.